One of our Stable favourites, Duaneo has been sold to Hong Kong. He is currently in quarantine in NSW and will leave for Hong Kong on 24th August. Duaneo, out of the mare Jedrzejczak and by Dylan Thomas was bred by Phil Warren. 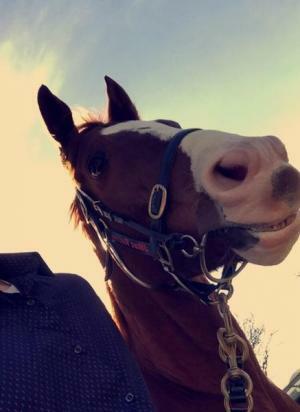 Duaneo has provided huge enjoyment for the connections having had 8 starts for 3 wins and 2 placings with 2 of the wins being in Adelaide. An offer to good to refuse was made for the flashy chestnut to go to Hong Kong. Duaneo's story gives hope to small breeders that the one of their home bred horses maybe a star of the future. We will be watching with interest how the "great man" fairs abroad.